Anyone up for a game of Monopoly? If you enjoy a good old game of Monopoly then you will love Monopoly on the Money. Monopoly on the Money is a 5 reel, 10 payline slot created by SG Gaming based on the board game everyone loves, Monopoly. The design is sleek and modern and looks exactly as you would expect a Monopoly game to look with all of the favourite game pieces, GO sign, and Monopoly money. Enjoy an array of great features including a free spins feature that offers up to 50 free spins, a gamble feature, and a big bet mode which awards even more. 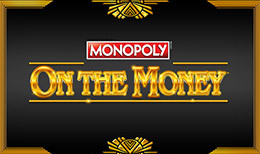 Monopoly on the Money is a 5 reel, 10 payline slot with a Monopoly theme. This is one of many thrilling Monopoly-themed slots created by SG Gaming. You'll take a trip to Monopoly City where you'll pass popular landmarks and invest in expensive properties. Visually, Monopoly on the Money is elegant with dark red reels and a sophisticated black background. Symbols include playing cards, various stacks of cash, and Monopoly pieces such as the dog, hat and cat. Free Spins Feature - Landing 3 or more GO scatters will activate the free spins feature. Here you will be awarded 8, 20 or 50 free spins respectively. Before every spin, you'll be given the opportunity to gamble. If you want the chance of winning even more free spins then you can gamble and win up to 25 more each time. The Monopoly man also makes an appearance in this feature. When you see him, he will give you a cash reward of up to 25x your stake. Big Bet Mode - The big bet mode is a series of 5 linked spins. In this feature, all of the symbols will increase in value which gives you a better chance of winning big. For example, all playing cards will increase to 20x your stake and the Monopoly on the Money symbol will increase by up to 400x your stake. £20 Big Bet Mode - Here you will be given 5 linked spins with scatters acting as wilds. These will remain sticky to help you win. £30 Big Bet Mode - Here you will play with 5 linked spins with scatters acting wild and sticky. Landing 2 scatters in this mode will activate the red hot respin feature. The chance card bonus feature can also be triggered where you'll pick from 8 cards to reveal a cash prize. £40 Big Bet Mode - Here 5 linked spins will be awarded with all of the features including a house extension feature where reels will extend by 1 position to form bigger and better winning combinations. £50 Big Bet Mode - In the £50 big bet mode you will be given 5 linked spins with all features. There's also a hotel extension feature where reels extend by 2 positions to create big wins. SG Gaming is one of the largest online casino operators in the iGaming world. They create online slots and casino games that are engaging, innovative and captivating. So many gamers around the world enjoy their slots as each one contains some of the best 3D animations, new technology, and unique gameplay. SG Gaming has over 100 titles and continues to grow by releasing several new games a month. They have slots to captivate players of all kinds including cute princess slots for those who love something more girly and football-themed slots for fans of sport. If you liked Monopoly on the Money, why not check out these SG Gaming titles? Monopoly on the Money is entertaining, exciting, and a whole lot of fun! The design is sleek and modern and the features are fantastic. The big bet mode is possibly the best feature awarding a variety of modes and prizes including 400x your stake for landing a line of Monopoly on the Money symbols. If you enjoyed this slot, be sure to check out all of SG Gaming's other Monopoly slots.